From the day on which Rizana was arrested on a false charge of murder to the day of her execution, seven years elapsed. During this time, if proper diplomatic effort was made with the required seriousness, the life of this young girl could have been saved. The following are some of the reasons for the failure on the part of the Sri Lankan government to get this girl released. Under the present Executive Presidential system, there is no effective chain of command between the various layers of officers who are to carry out orders at the demand of the President. A system in which each officer in the chain of command has to take responsibility for their part in carrying out a command and reporting back has ceased to exist. The President acts in an ad hoc manner when things come to his notice, particularly by way of public protest. Then, he makes some commands and sometimes sends out a delegation. There is no consistent follow-up to ensure that the matter is fully resolved. In this instance, saving the life of Rizana Nafeek could have been done at the early stages if the Sri Lankan Consulate in Saudi Arabia intervened and provided her the necessary legal assistance. However, until the BBC Sinhala Service brought the case to public notice, about 10 days after the death sentence had been passed, the Sri Lankan mission in Saudi Arabia had not made any intervention. By then, a fatal and wrongfully obtained “confession”, from which there is hardly any escape within the flawed Saudi Arabian legal system, had already been used against her. The second attempt to save her should have been to file an appeal immediately. The government refused to do that and claimed that they had a policy of non-intervention for Sri Lankan workers who are criminally charged outside the country. It was the intervention of the Asian Human Rights Commission and its supporters that made it possible to file an appeal. They raised the money for the appeal. On that basis, she was taken off of the execution list and had about five years before the execution. During these five years, the only way of saving her life was through effective negotiation with the family of the deceased infant. The government of Sri Lanka failed to achieve this negotiation. All kinds of gestures were done; Ministers travelled up and down from time to time. However, they failed to establish direct contact with the family and to deal with the issue. If they had in fact succeeded in making contact, they could have either made arrangements to pay the blood money or otherwise obtained mercy from the family. The establishment of this contact would have required consistent efforts on the ground, given the cultural and language problems that exist. It was only through diplomacy on the ground by diplomats based in Saudi Arabia that this could have been done. However, the nature of the foreign ministry work under the present Sri Lankan system of administration means that consistently following up and monitoring does not happen and there is no one to be held responsible for carrying out such a mission. Whenever there was public demand for action, the Ministers made public statements, even to the parliament, stating that efforts are being made. This was done merely to appease the public discontent. Most of the time, the ruling these days is done only by way of the state media and giving public statements. No substantive work is done at a practical level. At the heart of the system, there is no logically consistent system that links the leader with his staff. Rizana Nafeek’s case was a rare event, in which the entire public of Sri Lanka and millions of people in foreign countries came together in an attempt to save the life of Rizana. None of those who made efforts to save her got any kind of encouragement or a positive response from the government. The government treated the intervention by people for each other’s sake as a problem that creates political issues for itself rather than a positive development of a society that cares for each other. The government is completely negative towards the efforts of citizens to help each other. Its campaign against civil society activism and NGOs as a foreign conspiracy against itself has created mentalities within the government which stifle civic initiatives and the people’s cooperation to deal with their common problems. At the heart of the ruling philosophy is a deeply hostile attitude towards the initiatives of the people. The government’s response to the people’s intervention is to merely make public statements or to make some gesture and not to attempt to understand what the people’s concerns are and to respond to them in a genuine and serious manner. Rizana Nafeek, as a seventeen year old girl, volunteered to help her deeply impoverished family from a remote part of Sri Lanka. She went abroad solely for this purpose. She is one of a large army of people, particularly women, who make enormous sacrifices by way of leaving their country to work in harsh circumstances in order to assist their families. The government benefits from these least advantaged persons in the country by way of earning a large portion of the foreign exchange, but they fail to take any effective measures on their behalf. The worst part of it is the extremely inadequate services provided by diplomatic missions in the workers’ time of need. The government considers serious interventions with the governments of the receiving countries on behalf of these least advantaged persons, when required, as an obstacle in their relationship with the governments of receiving countries. An almost slave-like mentality prevails, where Sri Lankan authorities are unwilling to be embarrassed by intervening on behalf of their citizens with the foreign authorities. What is often said is that keeping the relationships is more important for the sake of earning foreign exchange, rather than to insist on the rights of their citizens when the need arises. It was this mentality which prevented an aggressive approach on the part of the Sri Lankan government regarding this young girl, who was wrongly treated throughout by the “justice” system of Saudi Arabia. In similar instances, other governments, including the Indian government, make strenuous and effortful interventions. It was a combination of factors that contributed to the failure on the part of the Sri Lankan government to save the life of this young girl, who was innocent and she was wronged by the country where she went for employment. These factors arise out of the Executive Presidential system of Sri Lanka, which, by its very nature, is unable to develop and maintain an administrative machinery that is able to serve the interests of the people. Rizana Nafeek is a poor victim of this system. No amount of blaming other factors would serve any purpose that is beneficial to Sri Lankan people so long as the negligence that is a logical product of this disconnected system is addressed. Rizana Nafeek is also a symbol. A symbol of the vast section of the Sri Lankan people who belong to the least advantaged sections of society. The symbolism that her situation demonstrates is that the government machinery as we have now is completely careless, insensitive and irresponsible when dealing with this segment of our society. Her tragedy is an illustration of the tragedy of all the people who are in her condition. The present move to undermine the courts in Sri Lanka by proceeding with an impeachment that has been held to be illegal by the superior courts in Sri Lanka can lead to the development of the kind of courts that have no judicial power and therefore can become like the courts of Saudi Arabia. The enormous danger involved in undermining the courts may in the future affect the rights of Sri Lankan citizens, and that is illustrated by the case of Rizana Nafeek. Rizana Nafeek’s case is a clear illustration that the system of “justice” in Saudi Arabia is fatally flawed and does not incorporate the basic notions relating to fair trial that are universally accepted. In this instance, there was no evidence of murder at all, but the verdict given was for murder. The infant in this case most probably died of some natural cause. As there was no post-mortem, there is no evidence as to what the cause was. According to Rizana, when she tried to bottle feed the child, the milk oozed out of his mouth. “Asian Tribune contacted a leading Doctor in Sweden and sought clarification from him regarding milk oozing out through the nose and mouth of the infant. When there is a ‘Stop’, the milk will not go into the stomach, but will ooze out. This might also be a symptom, that it may be either due congenital or existence of a tumor. Therefore it can be also assumed that when the milk the house maid bottle-fed oozed out, the child might have already passed away. Maybe due to desperation, the mother of the child accused Rizana of foul play without any evidence. The seventeen year old girl was handed over to Saudi police, who interrogated her without an interpreter. This was accepted by the Saudi court when the appeal was taken up. The police forced her to sign a confession in a language she did not understand. This “confession” was the sole evidence on which she was convicted. Despite the appeal court in Saudi coming to an understanding of the manner in which this confession had been obtained, they had no power to set aside the verdict according to their law. An enormous amount of interventions were made to the Saudi authorities by millions of people throughout the world, asking to grant her pardon on the basis of the unjustness of the verdict given by a primitive legal system. The President of Sri Lanka himself sent an appeal for mercy to the King of Saudi Arabia twice. There were high level interventions, such as by the European Union and by Prince Charles from the United Kingdom. In reply to a letter sent to Queen Elizabeth, Buckingham Palace stated that, as the constitutional monarch of the country, she had referred the letter to the Prime Minister for necessary action. Despite all such interventions from individuals and organisations, no action was taken. It is hard to guess how many innocent lives of people like that of Rizana have been devoured by this system. Appeals were made to the United Nations High Commissioner for Human Rights and submissions were made to the Human Rights Council. We are aware that the High Commissioner’s office did their own inquiries into the matter and intervened with the Saudi authorities. However, the human rights system has not adequately intervened to deal with the absence of fair trial provisions in the Saudi Arabian system of law. The ineffectiveness of the United Nations human rights mechanisms in dealing with such grossly unjust and inhumane systems, including the use of the death sentence even without a guarantee of fair trial, is worrying as the United Nations is the last resort that victims can turn to. If powerful countries like Saudi Arabia are not held responsible for gross violations of human rights conducted by their legal system itself, the credibility of the United Nations could be severely undermined. I assumed Government only wasted tax payers money to send delegates to Saudi Arabia to discuss. What they have done, to be honest nothing. I still feel ashamed about myself as a Sri Lankan who couldn’t play a role to save her. If Government is really taking interest to save her then why they have not fast-track the case of forge passport prepared by the agents to Rizana. 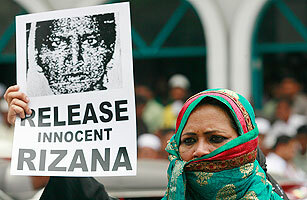 A VIP’s case are processed very fast but poor people like Rizana’s case not taken seriously in Sri Lanka courts. If they would finished the case of proving that Rizana was 17 and made a passport with increased age. Then our government could have used that judgement and fight for her release based on she is minor during period of incident took place. You are very correct. The GOSL had other priorities like the Impeachment, obtaining loans at high interest so that they could get a good kick-back, etc. As per News.lk, the official Government News portal of Sri Lanka, Keheliya has stated that upon a request of President Rajapakse, the Saudi King has made every effort to save the life of Rizana and the King was prepared to give 3 million Saudi Riyals as blood money. If it is so, please request the King to give on behalf of Rizana to the family of Rizana and also to build a Convent and a College in Rizana’s memory in her village. Keheliya is tring to cover up the irresponsibility of the President and the GOSL by hoodwinking the general public. If what he says is true, the GOSL can prove it by requesting atleast 33% of that money to be given to Rizana’s family and to uplift that village in late Rizana’s memory. I am not a Muslim but I feel that is the best way to pay homage to this innocent girl and I hope that the Ministers will not take a share from that blood-money too. As far as i know gov did inform that she was a minor. Yet Saudi gov did execute her despite knowing that. Warlord Abdulaziz raided many places in Najd to feed his family. On the night of January 15, 1902, 26 years old warlord Abdulaziz led 40 men climbed over the walls of the city of Riyadh on tilted palm trees and took the city of Riyadh. The Rashidi governor of the city of Riyadh, Ajlan, was killed in front of his own fortress – Masmak fort. Beginning with the conquest city of Riyadh in 1902, Warlord Abdulaziz consolidated his control over the Najd in 1922, and then conquered the Hijaz in 1925. The Wahhabis and UK supported warlord Abdulaziz and legitimized warlord Abdulaziz and his fight against the Ottoman Empire. Having conquered almost all of central Arabia, UK supported warlord Abdulaziz united his dominions into the Kingdom of Saudi Arabia in 1932 and changed his name as King Saud bin Abdulaziz. Since then the House of Saud always supports UK and its allies including USA. Warlord Abdulaziz married more than twenty women and fathered over sixty eight children including all of the subsequent kings of Saudi Arabia.Today more than 7,000 princes in the House of Saud, the result of multiple wives and lots of progeny. In 1863 the Illuminati Ashkenazi Khazar Rothschilds used one of their agents in USA, John D. Rockefeller to form an oil business called Standard Oil which eventually took over all of its competition in USA. Oil was discovered in Saudi Arabia in 1938 by US geologists working for Standard Oil. Standard Oil obtained a 50 year concession granted by Abdulaziz for an immediate payment of 30,000 gold sovereigns, veritably one of the greatest bargains in history. When the extent of breathtakingly large oil reserves became evident in Saudi Arabia, Exxon, Texaco Mobil and others joined in to form the mighty Aramco consortium. In exchange for security of the House of Saud dynasty by USA, the Saudi Arabia’s oil wealth and revenues have been handed over for exploitation and benefit of the Zionists and their Wall Street Corporations. The House of Saud regime controls “the largest family business” in the world without any popular mandate or accountability. When Warlord Abdulaziz took control of the Holy Places in Arabia from the Ottoman Empire with British support, he destroyed 15 centuries of Islamic heritage, including the desecration of the tombs of the wives and companions of the Holy Prophet, in the iconoclastic imposition of Wahhabism. The iconoclastic Wahhabi House of Saud gradually destroyed several holy shrines, including historical places of Islam from the Prophet’s house in Mecca and companion Ayoob Ansari’s house in Medina and turned them into apartment buildings and hotels. They also turned the site of the Prophet’s wives’ houses into a parking lot. Art, Music, dancing, laughing and weeping (including at funerals) have been forbidden by the Wahhabis. For a Wahhabi listening to music or dancing is haram but detonating explosive and killing innocent human beings is permissible. To enforce Wahhabism morals enforcers known as mutawwiin have been integral to the Wahhabi movement since its inception. Mutawwiin serve as missionaries, as enforcers of public morals, and as “public ministers of the religion” who preach in the Friday mosque. In addition to enforcing male attendance at public prayer, the mutawwiin also have been responsible for supervising the closing of shops at prayer time, for looking out for infractions of public morality such as playing music, dancing, smoking, drinking alcohol, men having hair that is too long or women who are not fully covered and dressing immodestly. The Wahhabi-backed warlord Abdulaziz took full control of the Hijaz, Mecca and Medina, in 1924 and established the modern state of Saudi Arabia, with Wahhabism as its official religion. Since then the House of Saud has promoted Wahhabism as normative Islam throughout the Islamic world. The House of Saud was consolidated on massive oil wealth and has spent huge sums of money building Wahhabi mosques, publishing Wahhabi literature and funding Wahhabi organizations world-wide. Today, with Wahhabi control of the Holy Places intact, virtually every aspect and corner of modern Islam has been penetrated by Wahhabi influence through the agency of the House of Saud. Through the control of the Hajj – the beating heart of Islam – and through their vigorous publication and propaganda means, almost all the Muslims are infected with Wahhabism to some extent. In Saudi Arabia there is no Church, Synagogue, Buddhist nor Hindu Temple is allowed. Wahhabism (pseudo Salafism) is NOT a religion of tolerance. Wahhabism provides the fundamental base for Jihadism which causes unending strife and misery. It is not Iran that should be bombed. In Iran there are still Jews living there and praying in their Synagogues. Muammar al-Gaddafi respected Christian and Jewish religions and their Churches, Synagogues in Libya but American, English, French, Saudi and Qatari financed terrorists destroyed Churches, Synagogues recently. Buddhist Temples including Bamiyan Buddha statues have survived in Islamic countries for centuries, but they could not survive under the Wahhabism. Washington and London are protecting Wahhabi extremists. In Syria Christians and their Churches were safe before the Westerners began sending their Wahhabi fanatics to kill innocent Syrian civilians. In Bosnia and Kosovo, under the guise of “reconstruction aid”, Saudi Arabia, Kuwaiti, and other Wahhabi organizations have demolished and removed major Islamic monuments (survived attacks by Serbian and Croatian militias) which were created by Muslims with an Islamic culture and tradition stretching back to 14th century long before Muhammad Ibn Abd al-Wahhab made his 1744 alliance with the warlord Muhammad Ibn Saud who founded the Saudi dynasty – House of Saud. In post- Muammar al-Gaddafi Libya,Wahhabi Jihadists bulldozed several Libyan Sufi mosques (including the Tripoli’s Al-Shaab Al-Dahman mosque) and Sufi graves (including the tombs of Libyan Sufi scholars Abdullah al-Sha’ab, Abdel Salam al-Asmar and of soldiers who fought Spanish colonialists). Wahhabi Jihadists also burned down several historic Sufi libraries in Libya recently. The case of Rizana Nafeek underlines the need for rule of law and justice. It is similiar to the case of the impeachment of the CJ in that both are a case of miscarraige and denial of justice and fair trial. Several issues are highlighted by this tragedy. In the first case the unlawful forgery of the birth certificate by the job agent and subsequent issue of the passport both indicate the level of corruption in the system. Secondly the non regulation of foreign labour in Saudi Arabia. The responsibility of caring for an infant which is clearly beyond the scope of duties of a house maid. Lack of training. Working long hours. Ill treatment etc. Thirdly the flawed system of law in Saudi Arabia and miscarraige of justice. The forced confession, trial without legal representation, not considering the true age of the accused, prolonged imprisonment, lack of medical evidence or post mortem for cause of death, lack of wittnesses which is a strict requirement of sharia law etc. Fourthly the disregard of the Sri Lankan authorities for their own citizens. Inability by the authorities to provide legal defence and blood money if required (could be covered by insurance). No proper intervention at the highest level. AS THIS RIZANA KID WAS AN UNDER AGED GIRL, WHO WAS AXED FALSELY. AND WE KNOW,HOW MOST OF THE THOSE UNEDUCATED, UNCIVILIZED MUSLIM SAUDIES ARE BEHAVING. THE GOVERNMENT’S REFUSAL TO FILE AN APPEAL IMMEDIATELY WAS ALSO AN BIG ERRANT. IT WAS ACTUALLY THE NEGLECT OF THE GOVERNMENT AND PARLIAMENTARIANS , WHO ARE THE BLOOD SUCKERS OF THOSE WORKERS TOILING IN FOREIGN COUNTRIES. IF THERE IS A GOON OR STOOGE OF THEIR OWN, THEY WILL COME TO RESCUE SOON. THEY AND THEIR FAMILIES SHOULD BE ASHAMED TO EAT AND ENJOY FROM THOSE WORKER TAX MONEY. NOW WHERE ARE THOSE REBELLIOUS MUSLIM CLERGYMEN IN SRI LANKA???????????????. Why do so many Sri Lankan women end up in the Gulf as slaves? The awful economic situation in the country and corruption has caused unemployment and extreme poverty among a large part of the population forcing our poor young women to seek employment in the Middle East. Today, the economy (earnings) of our country depends mainly on this slave trade, exporting the Sri Lankan women as Nannies, House Maids and Cleaners to the Arab world, selling them for just two hundred US dollars a month, to be exploited, abused, raped and humiliated. Back home, their families are left in shambles, children go astray. More than 12 lakhs (12,000,000) Sri Lankan women (80 % of them Sinhalese) now work in the Middle East (800,000 in Saudi Arabia alone) as house maids, cleaners and nannies, some of them working 18 hours a day for a mere salary of US$ 200 per month. If you happen to visit the major cities in the Middle East such as Dubai, Riyadh, Doha, and so on, it can be noticed that in most of the public institutions such as the Airports, Hospitals, etc which are used by multi nationals from all over the world, the toilets and floors are cleaned by none other than the Sri Lankan women. Also, if you go to the big hypermarkets or shopping malls in the gulf countries, most of the cashiers and sales girls are either Philippines, Indians or others where as the floor/toilet cleaners are, only Sri Lankan women. 15 to 20 percent of the Sri Lankan women who leave each year for the gulf return prematurely, face abuse or nonpayment of salary, or get drawn into illicit people trafficking schemes or prostitution. Hundreds of housemaids have become pregnant, often after rapes, producing children who, until Sri Lanka’s Constitution was recently amended, were stateless because their fathers were foreigners. More than 100 women come home dead each year. This slave trade, exporting the poor Sri Lankan women to the Arab world are more lucrative and a highly profitable business for the job agents/politicians in Sri Lanka. The Sri Lankan foreign employment bureau also earns millions on insurance. The poor women are harassed at the airport if they had not paid the insurance fee to the government. These women are one of the top foreign exchange earners for the country but the country/government has done nothing to them. It is very pathetic but, the Government, politicians and the so-called ‘elites’ who happily sit in luxury, do not care a damn about our poor women who are being pushed into slavery in the Middle East. It is high time that this practice of exporting our women as slaves should be stopped. We should follow our neighboring countries like India, Bangladesh, etc who have banned this kind of slavery long time ago. I am sorry but it is the pot calling the kettle black. Both the Saudi system and the Sri Lankan Govt. are barbaric as they do not have just laws, or independence to act in the interests of the aggrieved. In both countries, the rights of the poorest sections of the public who do not have the funds and the clout are left marginalized and accused of crimes they have not committed. The beheading is in stark contrast to bring it out into the open, but the murder in cold blood of a Pradeshiya Sabha member in Kelaniya by people who due to Ministerial protection believe they are above the law, is also no different to an innocent person being killed. In case anyone wonders why I compare the two events as similar. 1 Laws that apply do not do justice to the innocent, currently apply in both countries. 2 Blame is passed on to non-existent bodies or laws not accepted. 4 In both events the aggrieved are desperate to lay a blame but the system permits the guilty to go scott free. 5 It all concludes as gross injustice done to the innocent, ironically both end up dying. We cannot change the Saudi system, but we can change ours, so at least let us begin with what we can do. WHAT RIGHT HAS OUR “PREZ” TO ASK FOR JUSTICE, WHEN HE AND HIS CRIMINAL GANGS ARE ON THE LOOSE. If u can read the article, this is not abt sri lanka’s law and order. It is abt a barbaric act by the saudi gov despite many appeals from SL and HR groups. There is nothing good in mahinda to ask for justice. But that girl has the right to ask for justice and a fair trial. Baby Face Basil is the Biggest Thief Like Big brother MARA. MARA stole TSUNAMI fund. Bssil stole DIVINEGUMA 85Billion Rupee fund. Basil lied to the whole world saying there were ONE MILLION TOURISTS CAME TO SRI LANKA LAST YEAR. I went to Airport six times last two weeks…..but saw only a hand full of tourists (not more than 40 per flight) landing from planes at the Katunayake airport. TO GET ONE MILLION TOURISTS PER YEAR….YOU NEED 12 FULL PLANE LOADS (2,600) OF TOURISTS SHOULD LAND IN SRI LANKA EVERY DAY…..365 DAYS PER YEAR. Therefore Big Alibaba (Basil) like his Big Brother Lied and duped the whole world by telling a BIG LIE THAT SRI LANKA RECEIVED ONE MILLION TOURISTS LAST YEAR. Now Basil plans to steal Divineguma 85 Billion Rupees. IT’S TIME TO IMPEACH BASIL RAKAPAKSE FOR LYING TO SRI LANKA AND THE WORLD. Please watch the following video interview of ex.CJ Sarath N. Silva who explain how President Rajapakse went into Hedging Gamble while Sarat5h Silva warned him resulting One Billion US Dollars loosing to our country. Therefore I request Supreme Court or any patriot to take action against president to impeach him for his own decision resulting colossal losses to our country. 68 people were executed in the kingdom of Saudi in 2012. Did the AHRC do anything about them?. If so can the AHRC publish the details about all the actions and the subsequent follow ups by the consulates of the nations these people belonged to?. Srlankan Prez is on record asking for clemency for this poor Muslim woman. Can the AHRC name any Presidents or Prime Ministers of the contries of the other 67 people who have made similar pleas to the Kingdom?. Even in June 2011, Indonesia did the same thing. They recalled their Ambassador in Riyadh after one of Indonesian national Ruyati binti Sapubi, – a housemaid was beheaded by Saudi Arabian Authorities. However Indonesia did not stop there. Indonesian President Bambang Yudhoyono went on to condemn the beheading and accused Riyadh of breaking the “norms and manners” of international relations. He further vowed publicly, “I decided to apply a moratorium on sending Indonesian workers to Saudi Arabia, to be in effect from August 1, 2011, he said in a live TV address. He said Jakarta was considering applying a similar ban to other Gulf States where human rights activists say migrant workers also face abuse and exploitation. Similarly it is time Sri Lanka resolutely resolve against the brutality of the Saudi Government led by its King Abdullah bin Abdulaziz Al Saud. Sri Lanka Government must make Saudi King Abdullah bin Abdulaziz Al Saud responsible for the killing of the maid and announce the immediate ban on sending housemaids anymore to that country. Housemaids already sent there must be traced and recalled if the wish to return. Thank you AHRC for the dedicated, hard work you engaged in to try to save Rizana. I also appreciate your making this necessary analysis while many of us are still reeling from the tragic outcome of years of anxiety and millions of small personal efforts. Apart from (unanswered) letters to our then Minister of Foreign Affairs, and messages to the current Minister of External Affairs, one thing I myself tried, was emailing our Ambassador in Riyadh with a number of (to me) sensible and useful suggestions and requests. In 2010, emails to both the general embassy address and the ambassador’s personal email, met with total silence. Despite the huge concern that had developed by then about Rizana, our embassy had not even bothered to create a standard message for a response to such enquiries. My email to the ambassador (his personal mail) included enquiries about Rizana’s health (there had long been silence about her), a request for help with getting a letter (I was obtaining an Arabic translation) sent to the Otaibis (naturally to be vetted by the Embassy), and an enquiry re the possibility of sending supportive letters to Rizana. One thing I had hoped to send Mrs Al Otaibi was a copy of the Swedish doctor’s proffered diagnosis of what may have caused the baby’s death. I have this correspondence still. ACHR has rightly exposed the absence of a proper chain of command. I would add to that an irresponsible approach to diplomatic posting. I believe that soon after Rizana was found guilty our Ambassador to SA was changed! Instead of being retained to maintain continuity on a crucial matter. And since then there have been about 3 more Ambassadors! How many of them are fully conversant with the ins and outs of this case? One last comment. I also tried to find an ‘expert’ here in Sha’aria law as practiced in Saudi Arabia, sound information on the legal process there, and information about a family like the Al Otaibis (their particular standing etc in Saudi society), none of which I was able to gain from the books I bought about SA from the time this tragedy began to disturb me. Here again, I failed to obtain any help, admittedly from my limited range of contacts. There’s another point worth to be taken into account here. there?Why should we be living like shameless creatures? Not only is there no proper chain of command, the Director of the Presidential Unit for Policy Research and INFORMATION still doesn’t even know Rizana’s name! What hope for negotiations on her behalf if a very senior, experienced well-versed in English, journalist, employed in a crucial capacity of information to the President –IN HIS very OFFICE — cannot gether name right after all these years! At least honour this long suffering girl and her family after her death by using her proper name. Show SOME respect. I wonder how many letters went out from govt sources with the wrong surname of the subject.. Perhaps a Rafeed was saved instead. That is a wrong video. It showed the execution of an indonesian woman with a rong title. Rizana Nafeek probably could have been saved if the Foreign Ministry and our Mission in S. Arabia went about their work professionally. As far as I know every year several offenders – many serious – are pardoned by the King on high-pressure representations. Sulthan Al-Ghazi, probably a Jordanian, was sentenced last year to death for killing Saudi Sheikh Khalaf Al-Shaman. But he was pardoned and released at the written request of King Abdallah. An un-named Filipino was sentenced to death for drug related offences in April 2011 but released on an appeal by the Filipino President. On both the 2 governments concerned worked hard, using their local missions well, and had their citizens released. Our problem is we man our Missions mostly with misfits and personnel with little efficiency at the beck and call of politicos of various parties at home. Most of our missions are manned by individuals for about 1-2 years and then replaced by others to satisfy political needs in Colombo. Result – total failure of our diplomacy. Every year many governments secure concessions from the Arab governments where they are located relating to their own nationals. I wonder if there is anyone out there who is recording the experiences of women returned from working in households in S Arabia. Long ago the CSR had a newsletter with some relevant material, but who records it now?